In this funny, uncannily wise portrait of the dynamics of a sixth-grade class and of the greatness that sometimes comes in unlikely packages, Dwight, a loser, talks to his classmates via an origami finger puppet of Yoda. If that weren't strange enough, the puppet is uncannily wise and prescient. 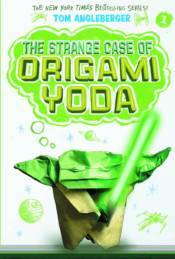 Origami Yoda predicts the date of a pop quiz, guesses who stole the classroom Shakespeare bust, and saves a classmate from popularity-crushing embarrassment with some well-timed advice. Dwight's classmate Tommy wonders how Yoda can be so smart when Dwight himself is so clueless.